I wish I had something beautiful to say to start this entry, but next to Calvino my writing feels pedestrian and my observations mundane. Invisible Cities is breathtaking. I don't think -- though I am not entirely sure -- that this book is genius or perfect, but it was a remarkable reading experience and I'm looking forward to going back in once my own copy arrives. I am looking forward to tracing threads and mulling over ideas and wallowing in the language. Thanks to Aarti, I went into this book knowing what to expect. I knew I wasn't getting a novel, though there was a hint more of a narrative (though really, it's hard to call it that) than I did expect. But as she said, it was a series of very short pieces, some only a paragraph and at most three or four pages, each about a different fictional city or describing an interaction between Kublai Khan and Marco Polo. The pieces are each related to each other, though sometimes in very tenuous or subtle ways, and the interactions between Kublai Khan and Marco Polo bookend each of nine sections. There is an overall pattern, like a piece of music, and there are other, less obvious patterns at play throughout the book. It feels like the sort of book that I might actually want to read critical interpretations of, but at the same time I want to resist, so I can discover it for myself. Each city is its own entity, but each city is also every city. Some might say -- the blurbs do, Kublai Khan eventually does -- that it is just one city Marco Polo is describing; I have never been there, but I recognize it in the cities I do know. And yet they are strange and wonderful, too, each city described. And perhaps even better is to recognize cities that truly do exist today in the same strange and wonderful terms, a moment of sheer reading perfection when it comes about unexpectedly. Sometimes I worry that I'm too much Mary Bennet, making my extracts and barely scratching the surface of meanings, living through my books and not enough through my experience. But I've made extracts, and here are a few to share. So if I wished to describe Aglaura to you, sticking to what I personally saw and experienced, I should have to tell you that it is a colourless city, without character, planted there at random. But this would not be true, either: at certain hours, in certain places along the street, you see opening before you the hint of something unmistakable, rare, perhaps magnificent; you would like to say what it is, but everything previously said of Aglaura imprisons your words and obliges you to repeat rather than say. Therefore the inhabitants still believe they live in an Aglaura which grows only with the name Aglaura and they do not notice the Aglaura that grows on the ground. And even I, who would like to keep the two cities distinct in my memory, can speak only of the one, because the recollection of the other, in the lack of words to fix it, has been lost. 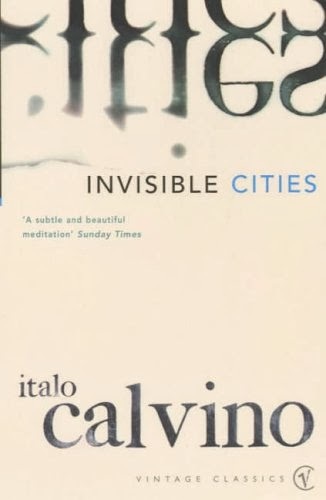 There is a lilt and a lull to the way Calvino writes that I find very pleasant. Maybe it's the original Italian, maybe it's just Calvino (I am not sure I have read anything else translated from Italian, at least not in recent memory.) And the end of the book felt just right to me, which is a rare and lucky and excellent thing. This book isn't for everyone, and at one point might not have been for me, but it was exactly the sort of thing for me right now and I am so very glad I read it. More Calvino in my future, for sure; I don't really care what form it takes as long as he wrote it. You always seem to get me most excited about inter-library loans right before they have to go back. And then you can't ILLO them again, so we had better buy you a copy if I am ever going to read it?